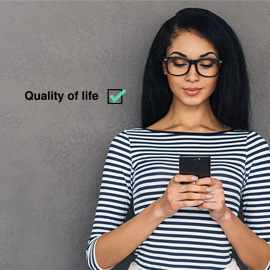 What rating do you give to your quality of life? On a scale from 0 to 10, where do you think you are? And if you’re quite low, do you know why? What are the things you could do to improve it? Quality of life is made of many things: our physical well-being, the air we breathe, the relationships we have with people, the house or apartment we live in, the balance between leisure and work, the sports we do but also, our commute, the stress we might have to cope with or the meaning behind everything we do. Invent a solution (service, app, website) that will help people (working people aged 20 to 60 on average) improve their quality of life. Format: One page split into two parts: one visual and some text. Entries are accepted till March 27, 2016 23:59 UTC.